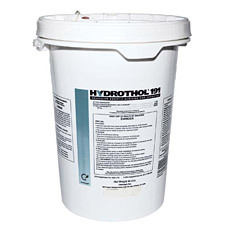 Hydrothol Granular is a highly effective contact algaecide and aquatic herbicide for use in irrigation and drainage canals, lakes and ponds. Apply when weeds and algae are actively growing. Hydrothol Granular is effective on a broad range of planktonic, filamentous, and branched algae and other aquatic weeds. Hydrothol Granular contains Mono(N,N-dimethylalkylamine*) salt of endothall. It is easy to apply and ensures complete kill. It controls hydrilla, coontail and stargrass. Would you like to see the Hydrothol Granular Label? How about the Hydrothol Granular MSDS sheet?